Wow, this is excellent. Would you mind sharing the source? This is one I've wanted to do for a long time! Kudos. (haven't looked at the attachment yet). I think that it's probably possible to get canny working fast, and also, you might want to look at that threshold filter from the apple "combed trail.qtz" :-) thanks for sharing! I think there's supposed to be a lib file in there, no? I'd expect to see something for the cv stuff, but maybe not. Awesome work, that can be very useful! It doesn't load here though, "QCPlugInPatch:ContourPlugIn" is missing. Tried 32/64 mode, patches/plugins folder. I'm on 10.6.8. Oooopsss... In fact I didn't noticed that the file size was 90Ko. @gtoledo3 : thanks for the "threshold" advice. I have my own GLSL Shader for thresholding, but I can't share it (licence problems) so I was looking for a good patch for the example comp. I'll look at the patch you're talking about ! Thx ! Whereabouts is combed trail.qtz to be found? Same result here @jrs in Lion. Sadly, even with the newly posted version, whether in either /Library/Graphics/Quartz Composer Plug-Ins or /Library/Graphics/Quartz Composer Patches or in ~/Library/Graphics/Quartz Composer Plug-Ins or ~/Library/Graphics/Quartz Composer Patches in Lion, precisely the same result, the patch does not restore successfully. Looks interesting from what I can tell of what other postees have stated as to their immediate experience with this patch. Thanks for the pointer to the Developer example mentioned by gtoledo & thanks to gtoledo for bringing that to our collective attention. Sorry to report that the plugin doesn't load in Lion. I did think that the Plug-Ins rather than the patches folder was the place to put you plugin, but had tried the other folders just in case they might work. Is there a dependency that needs to be satisfied client-side? Thank you for the Console message ! Actually I WAS using cvbloblib. Didn't notice that a reference was kept in the config. Sadly, no. Thanks for trying out a new build though :-). 32 or 64 bit QC 4.5 [10.7.2] the following is obtained with the plugin in either Plug-Ins directories. Cannot create node of class "QCPlugInPatch" and identifier "ContourPlugIn"
ditto on the Console message posted earlier. Unfortunately I only have one Mac. Could it be that QC considers it unsafe ? LOL :-). Thanks for the bold type caveat. Glad to hear you are making good progress though in understanding the root cause of the malaise. Ouch... In fact I was trying to link dynamic libs and the plugin was searching the path on my computer. Please, consider that - as I didn't manage to have an image output - I couldn't test the CV Threshold so if you want a precise result, you may want to use a "pre-threshold" for your image. Works!! on 10.6.8 and in 32/64 bit mode. This is the plugin I was hoping for a long time, thanks for developing and sharing! Success at long last. May you enjoy your well earnt slumbers Benoît :-). The result I get is well and truly spooky with the way the contours of one's face appear above or to the side of one's head. I think you might don't need to implement mean shift, I just implemented the camshift function in my small OpenCV project, which I will upload very soon. (I didn't have the chance to create good examples yet). It comes with a full blown camshift implementation and kalman filters to stabilize and predict the sensor data. @Peter : great ! I'm impatient to try your plugin ! Now that Benoit has his plugin working on both Snow & Lion I was wondering @jrs, if you found , as I have done, that the use of video input on Lion in QC is a trifle like use once but don't stop and restart, as the composition [any composition, BTW, not only any based upon or incorporating this brilliant new plugin of Benoit's] will hang, even crash upon restart? 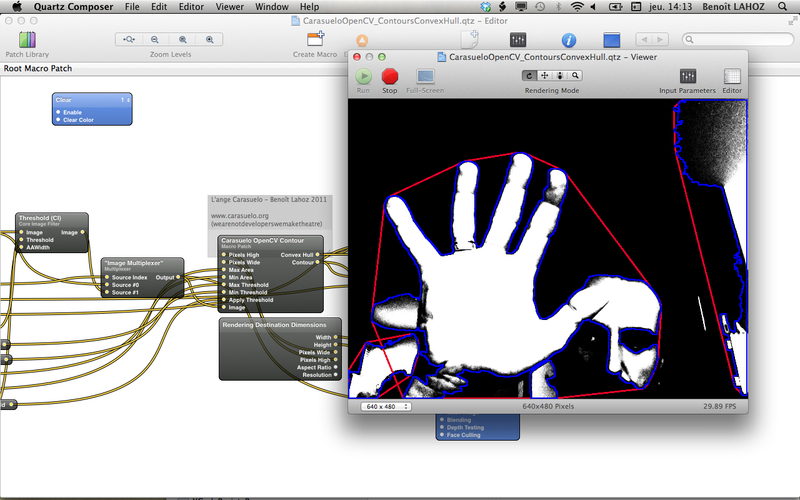 Here's a link to download the new unleaked version of my OpenCV Contours/Convex Hull plugin. 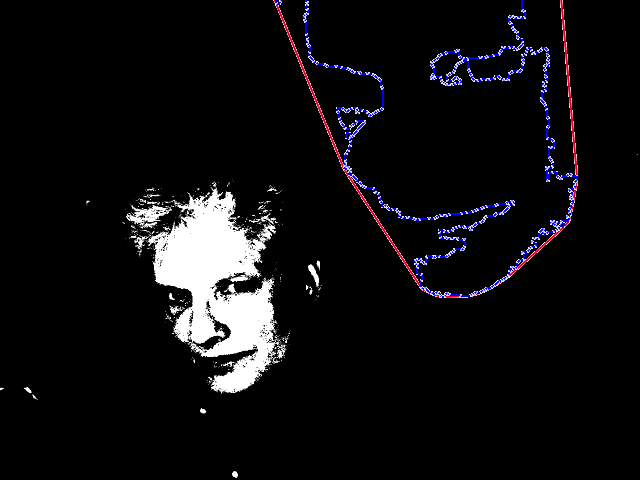 I added a "Presence" plugin that gets only the number of contours in the image without outputting a structure. It result in very fast "presence detection". I had huge leaks in the previous plugin. This one is far much cleaner ! Do you have a qtz setup for this one? I can't get it to not crash... I'm just feeding a 640x480 image, w/ 640x480 specified, and outputting the structure a gl line structure patch (first crash), and then the enable on a Billboard (2nd crash). I can't understand why but it seems that the plugin doesn't take still images as input. Only movies. I don't know if this is your setup. Could you post a console log if you have one, or your qtz ? It works really well for me, so I'm interested by feedbacks. This was with the video player. Just hook a video player to the patch, or the kinect. Then, hook the output of your patch to a billboard (so that you can try to monitor what it outputs). I don't have a composition handy, didn't save it. If I try it again, I'll try to send you a log. Do you have a setup that is known to work (re:, question above)? Here's is a sample comp and the plugin itself, as I don't know which version I posted here... Thanks for your feedback. FYI I'm working on 10.7.2 and the plugin is 10.6 compliant. 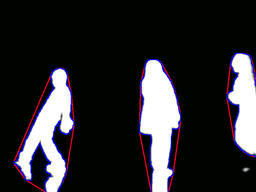 I have to work on the OpenCV threshold as it could be much better. 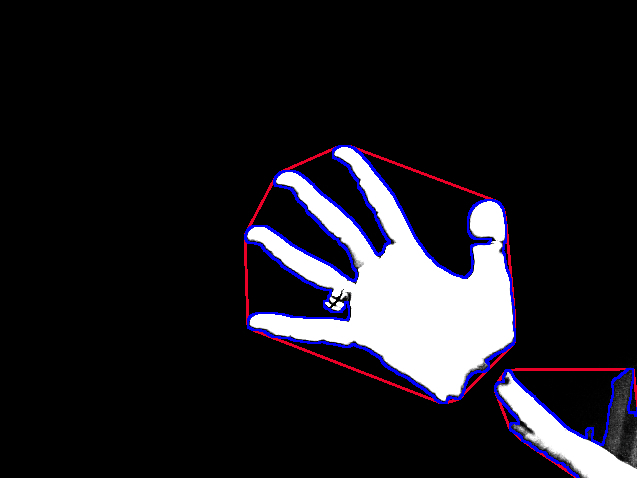 Next version will provide an adaptive threshold as a test (and the Delaunay constrained triangulation, which is now working but crashes sometimes without any apparent reason). I would be glad to see what you can do with it !